In my quest to prepare several new (to me) recipes out of Ina Garten’s “Back to Basics” cookbook before the October 26 release of her new cookbook, “How easy is that?” I have been trying a few of the easier recipes. I work full time and sometimes when I get home from work I don’t feel like cooking a multi-stepped, overly involved recipe…you understand, right? Since my photography lessons (self taught) aren't up to speed just yet, I borrowed this from Google. It's not what the pasta the recipe calls for looks like but you get the jest of the overall image. So…I made Pasta with Pecorino and Pepper last week. Wow, is it delicious and super easy. I confess I took the time to pick up an Italian ‘tagliarelle’ pasta…they carry this at most specialty markets and even had a version at Trader Joe’s. I also bought the Pecorino cheese at Trader Joe’s. I grow fresh parsley almost year round so I had that on hand. This recipe has a fresh herb taste and is very delicious, in my humble opinion. To go with this I prepared Garlic Ciabatta Bread (from the same book). I personally loved this bread, hubby thought it was good but not his favorite accompaniment to a pasta dish. I usually make a basic sour dough bread with butter, Lawry’s garlic salt and Parmesan cheese (brown under the broiler) bread. I thought the Garlic Ciabatta Bread was so fresh and flavorful, it’s a winner in my book. This really is a great book and the recipes are pretty easy. Place the peppercorns in a mortar and pestle and crush them until you have a mixture of coarse and fine bits. (You can also grind them in a small food mill or coffee grinder.) Set aside. Fill a large, heavy-bottomed pot with water and bring to a boil over high heat. Add 1 tablespoon salt and the pasta and cook according to the directions on the package until al dente. Ladle 1 cup of the pasta cooking water into a glass measuring cup and reserve it. Drain the pasta quickly in a colander and return the pasta to the pot with a lot of the pasta water still dripping. Working quickly, with the heat on very low, toss the pasta with 1/2 cup of the grated Pecorino, the crushed peppercorns, cream, butter, parsley, and 1 teaspoon salt, tossing constantly. If the pasta seems dry, add some of the reserved cooking water. Off the heat, toss in the remaining 1/2 cup Pecorino. Serve immediately with a big bowl of extra grated Pecorino for sprinkling. Place the garlic in the bowl of a food processor and process until minced. Add the parsley, oregano, salt and pepper and pulse twice. Does anyone remember that little book by Joan Walsh Angland titled “Spring is a new beginning”? I digress—Hubby and I are empty-nesters once again. Son #2 has been living with us most of this past year when stability with his employer’s company seemed uncertain. I’m happy to report the company has made a turn for the better so Son #2 is moving in with a couple of buddies he’s known since 2nd grade…history with friends is such a great thing. Son #2 even tolerated the toile quilt, what a good sport! 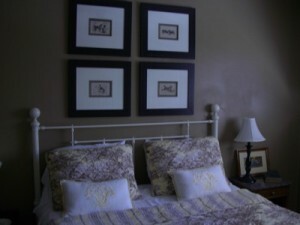 Since we’ll have our Guest Room back I look forward to a good “spring fall cleaning” and a purge of unnecessary items. 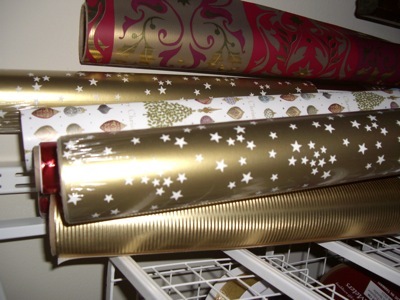 I’ll also move my wrapping paper and ribbon back in that room (which will make hubby very happy since it currently sits in close proximity to his work bench)…it must be a guy thing. I shop the after Christmas sale at Container Store every year with my friend, Debbie. I do have wrap for occasions other than Christmas. 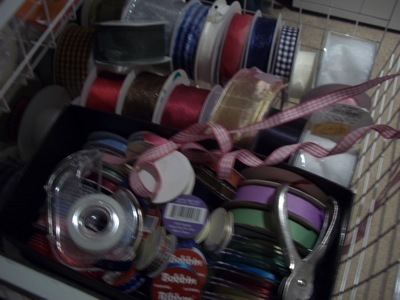 Looks like my ribbon drawer could use some attention. As with any new beginning—I’ve laid out plans for a few changes and I’ve decided one of those changes will be a plan to cook 1 new recipe (new to me) each week. I’ve always thought that even if I NEVER bought another new cookbook, which isn’t going to happen, I’d never be able to cook all of the recipes I have amassed. 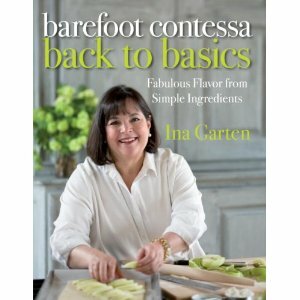 Besides Junior League cookbooks (which I almost always love, regular folks cooking good eats), Barefoot Contessa, Ian Garten, is probably one of my favorites! That said, I prepared Coq a Vin from her (BC) Back to Basics last Saturday—hubby loved it. I thought it was good but not great (my problem with it was that it tasted very much like beef stew only a little less full-bodied due to the chicken. My walking buddies said I couldn’t post the recipe because my blog should only feature recipes that I love! Anyway, I’m posting a recipe that I have never prepared before (how is that better you ask? Don’t know, but this recipe has been on my list for several weeks). 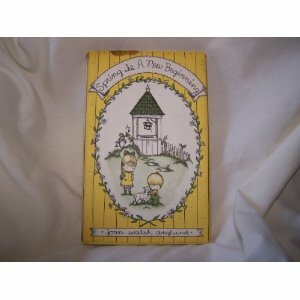 It was given to me by a friend who obtained it from a little inn in Italy (how romantic is that?) 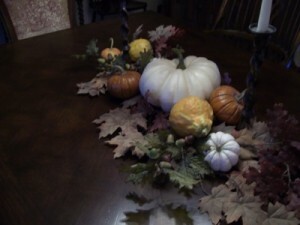 and she said she has prepared it for lots of dinner guests and the reviews are always wonderful. 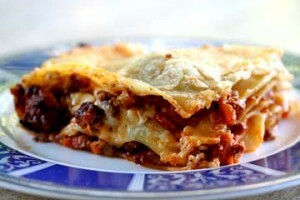 Image via Google search for Lasagna Bolognese...looks delicious, doesn't it? In one pan put butter, flour, salt and stir together for five minutes. Then add milk on medium heat. It must boil until the sauce is smooth. Remove from the heat, add powdered Parmesan cheese and mix Parmesan and sauce. Place in one pan a first layer of besciamella sauce, then a layer of lasagna (cooked pasta sheet) and alternate lasagna and besciamella sauce for five layers. Cover the last layer with besciamella. When you take off the pan from the oven you can put on the top pesto sauce or Bolognese sauce. When Mr. B and I got married I knew I wanted to improve my cooking skills (if you can call the spaghetti recipe and country style ribs recipe skilled cooking). Mr. B had a vested interest in this goal as well. The apartment complex we lived in brought in a cooking instructor and scheduled classes in our apartment club house. I can’t remember her name but her cooking school was called Bon Ton. A friend who speaks French said she thinks this might mean “good food”. I’d love to know—any French speaking readers out there? Let me know. 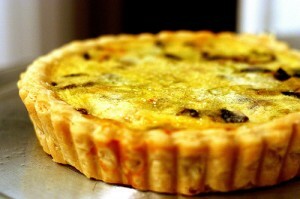 And despite the 1982 book authored by Bruce Feirstein, “Real Men Don’t Eat Quiche” Mr. B loves this recipe. I use a frozen pie crust, Marie Callendar and it is very flaky and delicious and EASY! Yum...great with a mixed green salad! Pierce pie crust and add pie weights or dried beans (to keep crust from puffing up). Bake at 375° for 10 minutes. Cool slightly; add other ingredients, dot with butter and bake at 375° for 25 minutes or until knife inserted in center comes out clean. 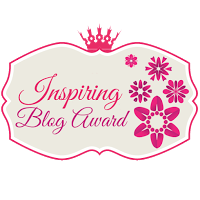 For those of you who have read my site, thank you Carla, Linda, Cayley, Darlene and Helen, you may know that my inspiration for starting Garden, Home and Party was the compliment and prompting by Son #1 and the ongoing encouragement of Son #2 and hubby. 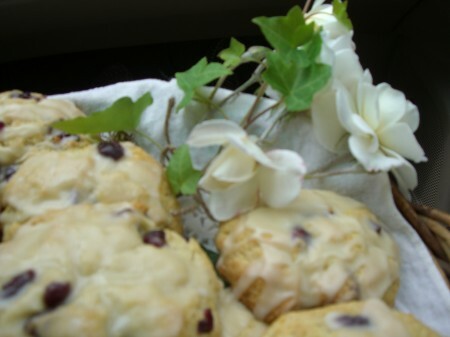 I posted this recipe for my 'favorite recipe for English Scones', but my photo doesn't do these sweet, buttery scones justice. That said, it’s been so much fun writing about the decor of various rooms in the house (any house), the maintenance and planting of my garden and the entertaining aspect—preparing recipes and setting tables, that I guess I’ve not posted as much about cooking/recipes as I thought I would. Rooms draw my attention, sometimes more than food! So it was with some interest when Son #2 commented on a recent post that he thought I should blog more recipes. It could be a ‘guy’ thing. Food is infinitely more interesting to the men in my life than the decor of our home, or any home for that matter. Since I take terrible food pictures he suggested that: a) I work on my food photography and b) link to recipes that I’ve found and tried from other sites. 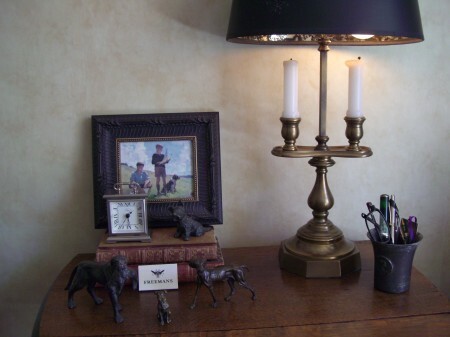 One of my favorite sites for delicious and sometimes easy recipes is Pioneer Woman. The other day she had a recipe called Grilled Chicken with Lemon-Basil Pasta. We had a dear friend over last evening for dinner and I prepared this recipe. It was a hit and very easy. I prepared warm baguette with butter and a spinach salad for the sides. Hubby grilled the chicken and the pasta came together easy-peasy. Please click on the link below to view the incredible pictures of each and every step of the recipe. You will love this site and I’m sure you will enjoy this recipe. Our public library has started a new program where they host a well-known chef who presents a lecture and demonstration on cooking. My good friend, Cayley, invited me to join her for the Tuesday lecture featuring Chef Cathy Thomas. Cathy is very entertaining and her recipes are always tasty. 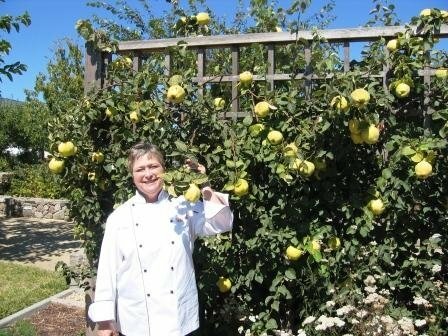 I won’t go into the details about Chef Cathy’s rich history and wonderful reputation as a fabulous cook (you can Google her) but I will share that she has a new cookbook on the market called, “Everyday Cooking with Organic Produce“. 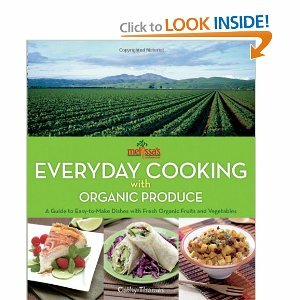 Cathy teamed with Melissa’s (a grower of organic fruits and vegetables that provides produce to most of our local markets) in writing this book. The recipes are delicious and really easy—necessary criteria for summer cooking. You will love how delicious and easy this salad is! 1. Bring large pot of water to boil on high heat. Add 1 teaspoon salt and orzo; cook until al dente. Drain, refresh with cold water. Drain and toss with 1 teaspoon extra-virgin olive oil. Set aside. 2. Place squash, red onion, bell pepper and tomatoes in large bowl. Gently toss. In small bowl or 4-cup measuring cup with handle, combine zest, juice, 3 tablespoons olive oil, 2 teaspoons salt, pepper and parsley. Stir to thoroughly combine. Pour onto vegetables and toss. Add orzo and toss. Taste and adjust seasonings. 3. Divide spinach between 6 small plates. Top with vegetable-orzo mixture. Sprinkle each serving with diced salami and crumble feta on top. Place a small pile of olives off to the side of each salad. Wraps are excellent for picnics due to their compact size and portability, no soggy bread to worry about. 2. Spread enough dressing on one tortilla to thinly coat entire surface. Place 1/4 of cabbage on lower half of tortilla; place 1/4 of each remaining ingredient on top of cabbage, adding salt and pepper to taste. Roll up as tight as possible; starting at lower edge, folding over ends to (tuck in contents) half way through rolling up tortilla. Give it a gentle push to seal. Cut in half crosswise and place on plate. Repeat process for remaining tortillas. I know these recipes appear to be long but they are super easy and would be great for a picnic. Happy Summer.